This Adorable Pup Is Learning Some Basic Commands! Look At Her Enthusiasm! Basic obedience training done in the early puppyhood of a pup’s life is incredibly important. This is because the younger the pup is, the easier it is for them to be trained and socialized. The reason for this? As their brain develops rapidly, it is like a dry sponge soaking up every little bit of information that can be used for the future. Because of this, any responsible parent will want to train their pup as soon as possible to take advantage of this. 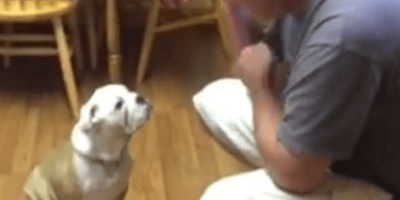 You can see that here in this video, where Dad is training Bella the English Bulldog pup in the family kitchen. It is clear that Bella is a very smart pup – she already has some commands down pat! It is a good thing that Dad has already instilled some basic commands in this pup. This will make managing her much easier in the future, and can possibly even save her life! These Adorable Pups Are Tasked To Find A Missing Pup! Check Out This Cute Video! This Adorable Pup’s Favorite Position Is Now Revealed To The Entire World!